Even during WWI the Russians realized mobile antiaircraft guns would be a way of life in the future. Prior to WWII they created a very handy pair of light automatic guns, the 25mm and the 37mm, similar in design to the Bofors 40mm guns. At the same time, they had created the 14.5 x 114 mm cartridge for their new light antitank rifles, the PTRD and PTRS, which went into service in 1941. These rifles were great for anti-material engagements and could even penetrate 32mm of armor at 500 meters, which made them lethal to early war German tanks and even later SP guns. Near the end of the war, the Soviets decided in 1944 to see if they could turn this into a machine gun round and use it for light antiaircraft duties. The weapon of choice turned out to the KPV heavy machine gun which came out in 1949. This fired the powerful B-32 AP round out to 3000 meters in ground use and 2000 meters in antiaircraft use, and was lethal to whatever it hit as it was twice as powerful as the US M2HB’s 12.7 x 99 mm round. Single guns fire about 150 rounds per minute, so in order to increase that capability the Soviets quickly produced single, twin and quadruple mounts. These were given the Soviet designators ZPU-1, ZPU-2, and ZPU-4, with ZPU meaning antiaircraft machine gun mount. They were produced by the thousands and also by other countries such as China. They remain in service to this day and were until recently the primary armament of the Soviet eight-wheel armored personnel carriers. The weapons are popular in the third world for their light weight, hitting power and mobility when mounted in light trucks as “technical” vehicles. But even with the advent of an explosive round the Soviets sought more lethal effects against aircraft. This resulted in adapting their popular 23mm aerial cannon to ground use in 1955 and in 1960 the new weapon came out as part of two new weapons systems - the light towed ZU-23-2 and the self-propelled ZSU-23-4 with water cooling for longer engagements and a radar system. The ZU-23-2 has been upgraded with newer fire controls and also attached light MANPADS missiles for increased firepower but the basic gun is still popular and made worldwide. On paper the ZU-23-2 is not as good as the ZPU systems - it only has a range of about 2500 meters on the ground and 1500 meters in air defense mode. But while its AP performance is only about the same at 30mm, its explosive round are far more lethal to aircraft, light vehicles and personnel and it has a rate of fire of 1000 rounds per barrel so can put out a greater density of fire. Likewise it is popular to mount the gun on trucks or in Russian service on the BTR-D airborne infantry personnel carrier for greater fire support. The first attempts that these guns came from companies like Eastern Express (ZU-23-2) and Military Wheels (ZPU-1) and were not really very good. Lately Meng has offered them with “technical” pickup kits or a very expensive single ZU-23-2 from Trumpeter (which was last seen retailing for $4 more by itself than the cost of this entire set). Now Meng has offered all four guns in one go and it is hard to think that fans of upgrades and battlefield conversions will not be delighted by this offering. The carriages of all 14.5mm weapons are separate sprues but the guns are all combined on separate sprues for use by these kits (L sprues). The ZPU-1 comes with a choice of the early fluted barrel or the later sleeved one with air cooling jacket. 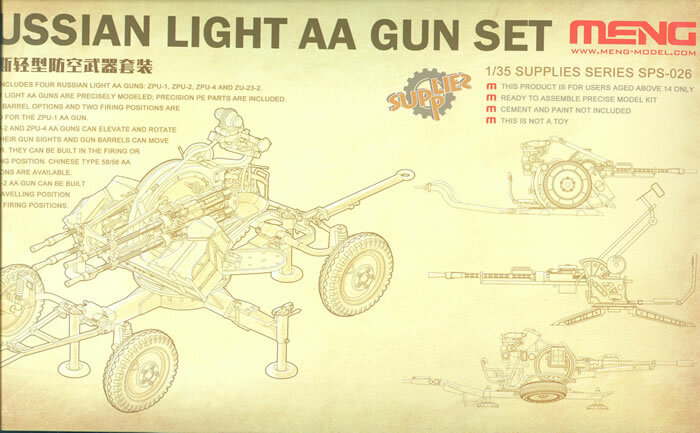 The ZU-23-2 cannon come on a bespoke sprue for that weapon, but all guns for all weapons come with slide molded flash hiders. The directions cover each weapon in turn starting with the ZU-23-2. The kit is described by a choice of three assembly options - travel, firing position ground and vehicle mounted. Assembly begins with the twin gun mount and then goes on to the carriage. While the guns may be left free to move, the balancer (H17, H18 or H19) is only set for one of three positions if installed. It is complimented by two nice ammo boxes and a 12 part gunsight for the weapon. Seats consist of five parts and are very delicately molded. Most of the construction is straight forward (their directions are excellent!) and you have an option to set the wheels for travel or in firing position. Next up is the ZPU-1. This weapon comes on two sprues by itself and does not have a transport carriage. The choice here is also either a Soviet/Russian weapon with sleeved barrel or the Chinese Type 80 with the original fluted barrel. This gun does apparently not have any limiters and may be set at an angle of the builder’s choosing. This is followed by the ZPU-2. Again this starts with a choice of either vehicle mounted, travel or firing positions. Also there is a choice of barrels again for either a Soviet/Russian ZPU-2 or a Chinese Type 58. After assembling the guns they mount on a twin mount platform and then onto the cradle. This has a simplified version of the ZU-23-2 sight used for this weapon, but a much more involved aiming and drive system. This weapon is far more “ornate” with oil bottles and other kit fitted to the sides of the cradle. Its ammo boxes are also far more involved with each one consisting of some eight parts. The seats are much simpler than the ZU-23-2 and have the option to be open for use or folded for travel. The wheels may be installed in either travel or firing positions based on how they are rotated. Thankfully the pins are “square” so that you do not have to futz around with the proper angles! Lastly is the ZPU-4, which is probably the most complex of the four guns. It gives the option of firing from a ground mount or travel, and again a choice of barrels makes it either the ZPU-4 or the Chinese Type 56. Each gun has a total of 9 parts but only 7 are used based on which weapon (Soviet or Chinese) the modeler chooses. The gun mounts for these weapons are quite involved so some care is going to be needed with this gun. It has a far more sophisticated ammo box mount and ammo box arrangement. There are no decals, and finishing directions show all guns painted in Soviet protective green (dark green similar to FS34088) or a ZPU-4 in sand. Overall this is a beautifully done kit with a LOT of potential to upgrade or modify other kits or to add that “right” touch to a diorama. Kudos to Meng for taking advantage of their kits to combine these together and offer them as a set.